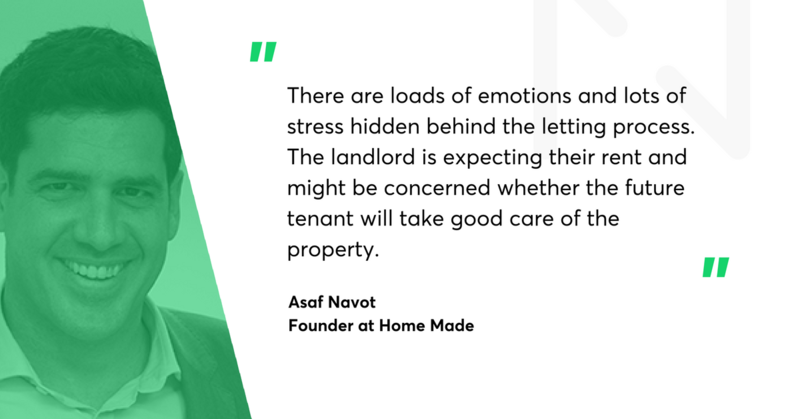 It all started with a personal experience - when he was looking for a flat in London, Asaf got really fed up with the service and fees of traditional estate agents in London. That’s why he decided to put his entrepreneurial skills into practice and set up a proptech company. He hit it right - Home Made’s revenues have been growing up to 75% monthly since its inception. 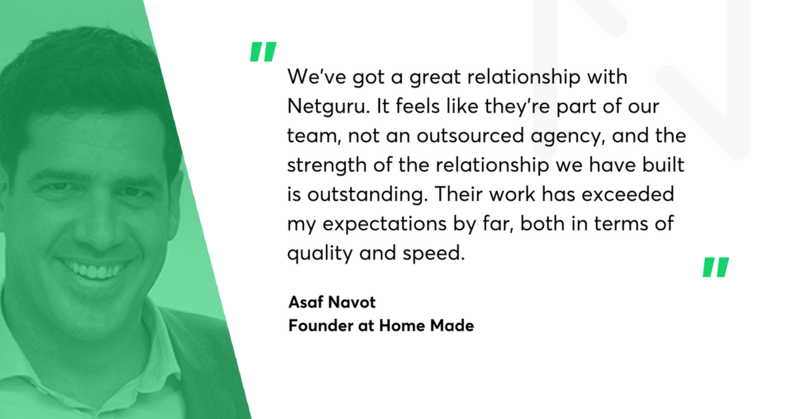 We spoke to Asaf Navot, the founder of Home Made, an online letting agency, about his experiences on the market from an agency perspective. Home Made focuses solely on lettings of residential letting of £500,000+ properties in London. His career path has been helpful in building a tech startup. Asaf holds an MBA from INSEAD and has extensive experience in strategy and operations, having previously advised multi-billion corporations as a strategy consultant. Yet, the UK property market is particularly difficult for entrepreneurs. “It’s a very complicated industry.” Asaf admitted. “The letting process differs depending on the local authorities, the landlord, tenant and the season. Even within London only you have different regulations,” he adds. Dealing with all of this is a big challenge for the emerging property startups. There is no universal method to cope with changing regulations. “We need to adjust our processes and platforms individually to these rules.” he summed up. Overcomplicated law is just the tip of the iceberg. The English estate market is a highly competitive one. There are thousands of estate agencies just in London. Despite the rapidly growing demand for properties in the UK capital, it’s not easy to stand out and win over clients. Not only do you have to compete with traditional estate agents that command more trust, but also with other emerging proptech companies. On top of that, you need to attract two parties - landlords and tenants - and manage the expectations of both parties. Properties listed on your website should reflect the needs of tenants, so you should ensure that you bring the right property owners in. Scaling up your business is also a challenge. Home Made wants to keep their superior end-to-end service of a top high-street estate agent, so each landlord has a dedicated account manager. “It is easy to run an online model with fifty properties, but very difficult if you have five hundred, and nearly impossible with five thousand without the right technology.” said Asaf. “We’re dealing with people who own tens-of-million-worth homes, so you need to be very thoughtful about their needs and expectations.” said Asaf. “There are loads of emotions and lots of stress hidden behind the letting process. The landlord is expecting their rent and might be concerned whether the future tenant will take good care of the property. At the same time, tenants are spending a huge sum when they move in, on rent, deposit, and moving expenses. It generates a lot of tension and dealing with it is not an easy task” said Asaf. Property markets were relatively late to jump on the tech transformation bandwagon. There have been huge inefficiencies within the sector, so many tech companies started to disrupt it with innovative solutions. It’s still at an early stage, but it’s evolving quickly. Startups such as Home Made threaten traditional companies, as they can offer the same level of service quality at a lower cost. They benefit from greater efficiencies through technology and can provide a significantly better customer journey thanks to process automation. It’s reflected in customer satisfaction. Despite the initial lack of trust for such companies, clients are now giving them positive reviews. “We receive very strong and positive feedback from our customers. Those who weren’t convinced at the beginning gave us a shot and now they are extremely satisfied with the service, as exampled by the high rate of repeating customers” said Asaf. He admitted that the model which allows landlords to enjoy the full range of services offered by a letting agency for a fraction of the cost is a major reason for his company’s success. “We charge our landlords a single, flat, success-based fee. In return, we will manage the entire letting introduction process, including accompanied viewings, external reference checks, contracting and payments handling” he explains. They’ve been growing substantially in the past two years, with their revenue increasing by 50-100% MoM. Their user base now comprises hundreds of landlords who own properties worth £500k+ in London. “We have a team of twenty people now and this time next year we expect to have around fifty employees on board. We’re expecting to continue to grow and remain focused on lettings in London.” said Asaf. Yet, he doesn’t rule out a plan to go outside of London and then the UK. When? Whenever they’re ready. But first Asaf wants to focus on the technology. “We’ve got our product developed with Netguru. We want to be able to scale the platform so it can serve more traffic. On top of that, we need to make the process as smooth as possible for all users, including people who are not used to technology. Netguru is keeping its fingers crossed for the team and looking forward to the next release!